I made this ages back and finally have the mood and effort to post it. In fact, I've made this several times as of now. Recipe courtesy of Rasa Malaysia. Rasa Malaysia posted two recipes which I find pretty close to one another. 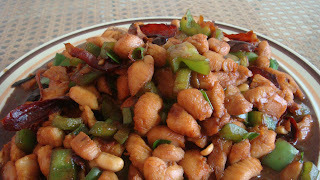 It's Kung Pao Chicken and Cashew Chicken. I've combined the two together to form this. 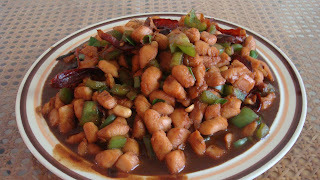 I've used Rasa Malaysia's Kung Pao Chicken recipe. However, before preparing the marinate, I've pre-marinade it with baking soda just like how the cashew chicken was done. I also retained the green capsicum and cashew and do without the roasted peanuts. I added cashewnuts instead! 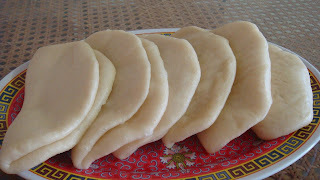 Apart from that,I have also made steamed bun from Gastronomy Domine to serve along the chicken. The buns were so soft and went down well with the chicken. My verdict, it was all delicious, absolutely fabulous and I wanna thank Rasa Malaysia and Gastonomy Domine for such excellent recipe and beautiful tips. Baking soda worked so find that I actually pre-marinaded all my diced chicken breasts before using/marinating with sauces and all. It removed the chicken-y stench and is excellent in making the chicken feel more tender with each bite. But I do sometimes find it a little troublesome to have to marinade twice. I do this dish when I have cravings and plenty time to spare. Else, I will stick to simple one pot dish for dinner. All in all, very worth the time spent and taste even better with the extra dried chillies! I am glad you like the recipe(s). Thanks.